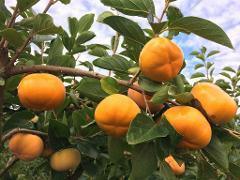 Book yourself in for a fantastic session of picking Sweet Persimmons! Tour includes a tractor ride between the shed & the orchard, a detailed explanation of how to pick the best fruit possible. sample one persimmon & buy whatever you pick. 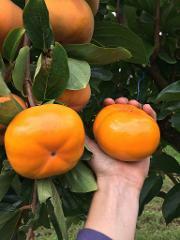 Book yourself in for a fantastic session of picking Sweet Persimmons! Tour includes a tractor ride between the blocks of fruit and shed, a detailed explanation of how to pick the best fruit possible. Pick as much as you want to buy. Book yourself in for a fantastic session of picking Sweet Persimmons! Tour includes a tractor ride between the blocks of fruit and shed, a detailed explanation of how to pick the best fruit possible. Pick as much as you want to buy! The best way to experience our farm. Includes the standard PYO experience PLUS 1kg of free persimmons, a free drink voucher, arrive anytime you choose from 9-12 and skip the queue to be on the very next tractor ride.